You can make these adorable Superhero Cork Coasters with just a few simple materials. 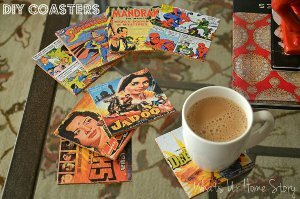 Great for giving as a Father's Day gift or hostess gift, these adorable coasters are great for comic book fans. Planning a DIY wedding? These coasters would make an adorable party favor. You can use newspaper comics, comic book pages, book pages, cards, or your favorite images to make these adorable coasters. You can even use leftover Christmas wrapping paper to make a set of coasters that make a great last-minute stocking stuffer or white elephant gift. Secure your print to the cork board square with painters tape and cut along the edge. Add a layer of Mod Podge (Matte or Gloss) to the cork and stick the print. Make sure to smooth out any air bubbles with a credit card. When you do this always start from the center and go towards the edge. Once it is dry coat the print and the sides (important) with Gloss finish Mod Podge. Repeat if necessary. I applied 2 layers of Mod Podge to be on the safe side.